In statements made in a probate court hearing last year, an attorney for the Department of Developmental Services and two other DDS employees appeared to demonstrate a bias against the father and sister of a developmentally disabled woman who have been seeking to visit her. 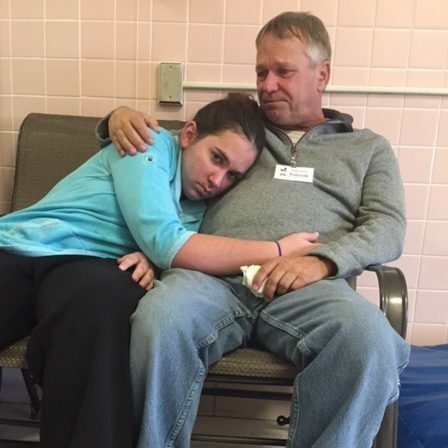 The August 17, 2015 hearing in Essex Probate and Family Court appears to have set the stage for a complete ban as of last Thanksgiving on all contact with Chelsea Barr by her father, David, and sister, Ashley. COFAR has urged DDS Commissioner Elin Howe to restore David and Ashley’s contact with Chelsea, who has both an intellectual disability and mental illness. COFAR is also questioning why DDS recommended the appointment of a guardian for Chelsea who had never previously met her. In recommending the guardian, DDS passed over David, Ashley, and a family friend, who had offered to be Chelsea’s guardian and knew her well. In the wake of allegations that Chelsea had been sexually assaulted over a two-year period by an alleged boyfriend of her mother’s, Chelsea was removed from her mother’s care and from regular contact with most of her family in 2014. Since last Thanksgiving, David and Ashley have been barred by the guardian from all contact with Chelsea, and even from knowledge of her whereabouts. However, neither David nor Ashley have been charged or implicated in the sexual assault case. The 70-minute recording of the probate hearing is replete with statements and testimony from Dorothy Wallace, then Chelsey’s temporary guardian, and from Jill Casey, a DDS service coordinator, and Barbara Green Whitbeck, a DDS attorney, that appear to indicate a bias against David and Ashley. The statements appeared to be intended to sway the probate court judge against appointing David as Chelsea’s permanent guardian or allowing more family contact with her. The prejudicial statements in the hearing include a claim by Whitbeck that erroneously implied that David either caused or was responsible for abuse of Chelsea when she was 12 years old, and a separate speculative statement that David and Ashley wanted to visit Chelsea out of “a sense of guilt.” Wallace also erroneously testified that records indicate Chelsea was sexually abused by another family member at the age of 12. Chelsea (left), David, and Ashley Barr at Tewksbury State Hospital last Thanksgiving, the last time David and Ashley were permitted to visit her. Other statements by Whitbeck, Wallace, and Casey appeared to be hearsay, and are strongly disputed by Ashley and David Barr. However, the statements all went unchallenged during the probate hearing because the Barrs did not have an attorney present at the proceeding who might have cross-examined the DDS employees. The recording of the court hearing provides an unusual glimpse into how DDS, a large public agency, uses its superior legal power and resources to overcome family resistance to its decisions about developmentally disabled people in its care. Without an attorney to represent them, individuals are virtually helpless in probate court cases. The hearing concerned a request by David and Ashley that they resume regular contact with Chelsea and that David be appointed as her guardian. The judge, however, ruled instead in favor of the appointment of Dorothy Wallace, the candidate recommended by DDS, as Chelsea’s permanent guardian. In her testimony, Wallace said the reason for her restrictions on contact with Chelsea was that David and Ashley became too emotional when they were permitted visit her, and that this caused Chelsea to have psychotic symptoms. Wallace also said that clinicians in one hospital were upset that David had promised Chelsea he would become her guardian and would take her home soon. That reportedly made Chelsea resistant to the idea of continuing to stay in the hospital, according to Wallace. Wallace’s testimony about what David might have said to Chelsea appears to be hearsay, however. David denied that he ever promised Chelsea he would immediately take her home from the hospital. None of the clinicians who reportedly overheard David making that promise to Chelsea were asked or required to testify at the probate hearing. No evidence was provided at the 2015 hearing, moreover, as to how or why an emotional interaction with her family would cause Chelsea to have psychotic symptoms. Wallace repeatedly testified that her intention was to reunite the family once Chelsea had been clinically stabilized. Yet, David and Ashley remain barred from any contact with Chelsea more than a year later. In early October, DDS Commissioner Elin Howe responded to an email from COFAR Executive Director Colleen M. Lutkevich, saying the Barr case was under departmental review. Since that time, however, neither David nor Ashley Barr have been contacted by DDS as part of that review. Howe has not responded to follow-up emails from Lutkevich, seeking information on the status of the DDS review of the case or whether or when David and Ashley will be allowed to see Chelsea again. The recording of the 2015 probate hearing, however, is a public document. While cases involving sensitive probate issues are usually impounded, meaning they are blocked from public access, DDS, for unknown reasons, only requested that the Barr case be impounded last August, a year after the hearing was held. …give a clear picture of a young woman who really has suffered unspeakable traumas in her life, beginning all the way back to about age 12 when she was residing with her father, and again in the past couple of years when she was residing with her mother… (my emphasis). This statement appears to imply that David Barr either personally abused his daughter or was responsible for abuse. But what Whitbeck was actually apparently referring to was one incident when Chelsea was 12 in which a friend of her brother allegedly inappropriately touched her when family members were not present, according to Ashley. David Barr has never been accused of or implicated in any abuse of Chelsea, and neither has her brother. There was no testimony given at the hearing that implicated David or Ashley in any abuse of Chelsea. Wallace did testify that she understood that Chelsea had Post-traumatic stress disorder (PTSD) “dating back to the age of 12 or 13 due to alleged sexual abuse from her brother.” This statement was not only hearsay, but it is apparently wrong. Other than her mother in 2014, no member of the family has ever been implicated or charged in any abuse of Chelsea. As noted, David and Ashley had no attorney representing them during the hearing, and therefore no one challenged Wallace’s claim about that alleged abuse of Chelsea when she was 12 or 13, or questioned how Wallace had come across that information. No one, in fact, asked that Wallace or the DDS attorney produce any records backing up her claim that Chelsea had been abused by a family member when she was that age. Whitbeck also said in her opening statement that “it is understandable that the family wants to be involved with Chelsea, out of a sense of obligation and maybe guilt…” This statement also went unchallenged. It’s a potentially damaging statement. Whitbeck never specified what the family’s guilt might be about and was never questioned about it. Other statements made by Casey and Wallace appeared to be intended to portray David and Ashley as overly combative with them. Whitbeck described David as a “bully,” and Casey testified that he had sworn at her when they first met and had once left a threatening message on her answering machine. She said his threat on the answering machine was a statement that “‘I’ll get you people,’ or something like that.” During the hearing, David tried to dispute that he had said that, but was admonished by the judge for interrupting. Ashley maintains that David has never been physically threatening, but may have threatened to sue DDS at some point over the restrictions placed on his contact with Chelsea. Wallace, when asked to describe the family’s interaction with her, testified that the family had been “chaotic and caustic.” But Wallace provided no examples of statements or actions by David or Ashley that could be characterized in those terms. Many of the accusations made against the family by Wallace and Casey at the hearing were based on apparent hearsay. In particular, Wallace testified that she had heard someone in one hospital say that David told Chelsea she would be coming home soon and that he would be named her guardian. This apparently upset the clinicians at the hospital, who then asked Wallace to ban further family visits, according to Wallace. But Ashley and David disputed that David had made any such promise to Chelsea. Rather, he said, he was trying to reassure Chelsea that one day she would be coming home. Chelsea and David at Tewksbury State Hospital. David and Ashley were accused of being too emotional when they visited Chelsea. Testimony provided by Wallace indicated either a lack of familiarity with Chelsea and her family or a lack of time to represent her adequately or act in her best interest. This raises questions in our view as to why Wallace was recommended by DDS to be Chelsea’s guardian, and why an offer from a family friend who knew Chelsea well was apparently disregarded. Wallace, who had never met Chelsea until just before she was appointed as her temporary guardian, appeared to be unaware or unsure of details of Chelsea’s care and living arrangements in the months prior to the August 2015 probate hearing. After having been removed from her mother’s care, Chelsea was moved in and out of shared-living arrangements and hospitals. She was admitted to Arbor Fuller Hospital in Attleboro in March 2015 and discharged in June of that year, just two months prior to the probate hearing. Asked during the hearing where Chelsea was sent after her discharge from Arbor Fuller, Wallace testified that she was unsure. “I think she want to respite or to Donna’s (a shared-living arrangement). I don’t know,” she said. Wallace said she was aware that Chelsea ended up at Tewksbury State Hospital in early August 2015, but she was unsure of the name of the psychiatrist at Tewksbury State who was in charge of Chelsea’s anti-psychotic medications there. Under questioning, Wallace also said she was unaware that Chelsea had a sister in addition to Ashley. Asked how many times she had visited Chelsea in the seven-month period since she had been appointed as her temporary guardian, Wallace described what appeared to be approximately six meetings with her. Few if any of those meetings appeared to be strictly social visits. At least one of those meetings was a clinical care planning meeting regarding Chelsea’s ISP (Individual Support Plan), while another visit was to meet an aunt of Chelsea’s who was allowed to visit Chelsea at Tewksbury State. As we’ve noted before, we think this case is being mishandled by DDS. We see no justification for the continuing refusal of DDS to allow any contact in this case between a young woman with special needs and members of her family who have nothing to do with the criminal proceedings that are involved. That denial of contact is further victimizing both this young woman and innocent members of her family. And an unjustifiable and deliberate misuse of taxpayer money. Have you done a FOIA request on this? Why isn’t job growth the first thing climate activists mention? Is Impeachment Really Bad Politics?